Acxiom knows where you live, where you shop and what you like to do. But it's not quite the evil data monolith you might expect. Acxiom is one of the largest data brokers in the world, yet few average consumers know much about it. You’re about to find out a bit more. But before I get into that I’d like to correct two errors related to Acxiom that appeared recently in TY4NS. Contrary to a report published in the Financial Times, which was later repeated by CNET and yours truly, Acxiom is not planning to open the kimono and let us all take a peek inside at the data it has collected about us. According to an Acxiom spokesperson, while the company is looking into the possibility of offering more transparency to consumers, it’s not yet on their radar, in part due to the enormous engineering challenges such disclosure would entail. So I when was offered the opportunity to interview the oldest — err, longest tenured -- privacy officer in the world, I jumped at the chance. But first some background about Acxiom. Most people know the company as a data broker. Some people know it as an online tracking company. But very few know that Acxiom is also an IT services firm. Given that it’s been gathering data about hundreds of millions of consumers since 1969, storing it on banks of mainframes at its headquarters in Little Rock and elsewhere, that shouldn’t be surprising. According to Gartner, Acxiom is one of the top three mainframe outsource providers in North America. As of last month, Acxiom is also a cloud services provider. Its PrivateCloud aims to offer secure mainframe computing services for enterprises in the $200 million to $2 billion range, says Acxiom Cloud Leader Jesse Luna. When it comes to data, Acxiom has two core businesses, Glasgow explained. One revolves around risk management; companies hire Acxiom to verify that people are in fact who they claim to be. The other collects data from a wide range of sources to build personally identifiable profiles which they then rent to marketers. So where does all this information come from? I wanted to know. For marketing data Acxiom draws from three primary sources, Glasgow explained. One is public records, such as property ownership or professional licenses. The second is consumer surveys, magazine subscriber lists, catalogs, and warranty cards. The third category is summary reports about retail purchases. Does Acxiom collect data from supermarket loyalty cards, I asked? No. Banking data or airline frequent flyer programs? No. Facebook and Twitter? No. Despite the fact social networks are largely public information, Acxiom doesn’t use them as a source. Voter registration records? Yes, she replied, though many states have restrictions on how they can be used. How about criminal records? I asked. Yes, she said, but only convictions, not arrests. And then only for the risk products, never for marketing. Acxiom data can’t be used for employment background checks, credit verification, or insurance underwriting, she adds, because that would make it a consumer reporting company under Fair Credit Report Act. Companies regulated under the FCRA can’t use that data for marketing purposes. For the last few years Acxiom has also been active in the online tracking space. But here too, Glasgow says most people misunderstand how Acxiom uses your data. When you visit a Web site that deposits an Acxiom cookie, it will request data about your offline interests and activities to “enhance” the profile it has of you. But it will only request this data if the site already knows who you are – ie, you’ve logged in. And once Acxiom provides that data, it erases any links backwards to its master records, Glasgow says. In other words, the site knows more about your offline habits, but Acxiom doesn’t know anything about your online activities. In any case, she adds, most of Acxiom’s clients have already purchased enhanced offline data about their customers, so it’s largely moot. 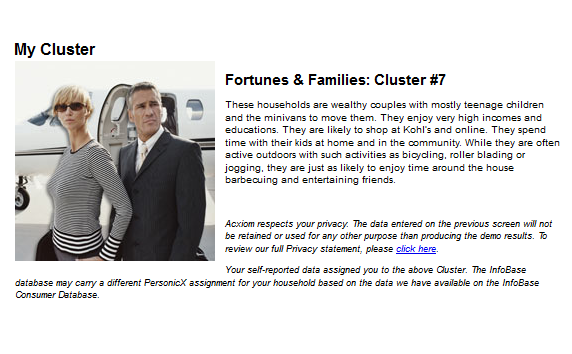 So if Acxiom has these massive troves of data, I asked, why does it think I own a Lear Jet? She laughed. With all of the doom and gloom about privacy lately, I asked Glasgow if she was optimistic about the future of privacy. Starting in the 2000s, we began to see more laws spelling out what people can and can’t do with data – mostly in Canada, Europe, and Asia. While they don’t have legal force here in the States, they do provide companies with guidelines for acceptable behavior, she says. Today, with data exploding all over the Web and mobile devices, the old models don’t work any more. You can’t just give people notice that data is being collected and offer them an opt out; everything depends on the context in which the data is used, she says. So, is privacy dead, or merely on life support? Got a question about social media or privacy? TY4NS blogger Dan Tynan may have the answer (and if not, he’ll make something up). Visit his snarky, occasionally NSFW blogeSarcasm or follow him on Twitter: @tynanwrites. For the latest IT news, analysis and how-to’s, follow ITworld on Twitter and Facebook.